Ahh Memorial Day Weekend, the unofficial start to summer. The Farmer's Market is in full swing, the flowers are blooming on Pearl Street, and Boulder Outdoor Cinema is almost ready to kickoff a new season. Here's a few weekend events to check out. The Bolder Boulder. This is Boulder's annual Memorial Day 10K race. 50,000 partipants are expected to take part. 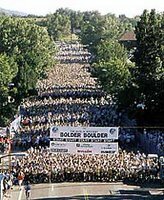 In teams or alone, this event brings thousands of people to Boulder to enjoy the sunshine, watch individuals and teams walk, run, and jog the race course. Truly a centerpiece event in Boulder. The 19th Annual Boulder Creek Festival. A favorite event in Boulder County, the festival includes three days of music, dance, food, and events unique to the Boulder community. There are twelve separate event areas and hundreds booths featuring community arts and crafts, health alternatives, technology and more. Meanwhile, six performance stages will feature a spectrum of music and dance. The main event is the Great Rubber Duck Race, with proceeds going to support the EXPAND program for people with disabilities. While Memorial Day is celebrated, it's also a day to commemorate the men and women who died in military service for our country. Many people observe this holiday by visiting cemeteries and memorials. A National Moment of Remembrance takes place at 3 p.m. Another tradition is to fly the U.S. Flag at half-staff from dawn until noon local time. Here's a list of local Memorial Day services and events . AFA wreath-laying: The Memorial Day Wreath-Laying Ceremony and Organizational Awards Parade are at 10 a.m. at the U.S. Air Force Academy's Stillman Parade Field north of Colorado Springs. Arvada ceremony and parade: The American Legion Post No. 161 and VFW Post No. 4331 in Arvada are sponsoring a Memorial Day Ceremony and Parade at 10 a.m. at the Arvada Cemetery, 5581 Independence St.
Boulder service: A Memorial Day service will be held at 7 p.m. at the Admiral Burke Memorial at the corner of Mohawk and Thunderbird drives. 10th Mountain Division ceremony: The 10th Mountain Division of WWII will have a ceremony at 11 a.m. at Tennessee Pass on U.S. 24 between Leadville and Minturn. Commerce City Parade: Commerce City's 40th Annual Memorial Day Parade will begin at 10 a.m. at East 64th Ave. and Olive St. and proceed to the Commerce City Recreation Center. Military walking tour, picnic at Fairmount Cemetery: A military walking tour, led by Ken Gaunt, Fairmount Cemetery's military historian, will be at 4 p.m., 430 S. Quebec St. A community picnic will be held at 5 p.m. The Queen City Jazz Band will perform at 6 p.m.
Ceremony honoring Japanese-American vets of WWII: Conducted by American Legion Nisei Post No. 185, the ceremony will be at 11 a.m. at the Japanese-American War Memorial in Fairmount Cemetery, 430 S. Quebec St.
Fort Logan service: Fort Logan National Cemetery, 3698 S. Sheridan Blvd., service is at 11 a.m. at the flagpole. Marine Corps Memorial ceremony: The Marine Corps Memorial Association ceremony is at 2 p.m. at the Marine Corps Memorial at the intersection of U.S. 6 and U.S. 40 in Golden. Olinger Crown Hill Cemetery concert: Olinger Crown Hill Cemetery, 7777 W. 29th Ave., Wheat Ridge. Dove release and El Jebel Pipe Band March at 10 a.m. A bagpipe concert will be at noon at the Tower of Memories. Groove Society will perform music at 1 p.m. A retiring of colors will be at 6 p.m.
Rally by veterans opposing Iraq war: A Memorial Day rally with war veterans and their families challenging the war in Iraq will be at 2 p.m. at the Bolder County Courthouse on Pearl Street between 13th and 14th Streets. The event is sponsored by the Rocky Mountain Peace and Justice Center.